I use cold calling to get names of people that are embedded in companies. I go to databases like jigsaw to get numbers to start my calling routine into the company. This example was hard because calling into hospitals is nerve racking. BUT, once you get the lingo down most of them are organized in the same way. Getting people to come tot he phone though is another thing. You did well! Ah..I should have through about Jigsaw to get more names. Cold calling is nerve racking no matter who you’re calling, but it really helps to figure out how those you are going to speak with are motivated, by what they do for a living, and almost live their role mentally and emotionally before you call them. 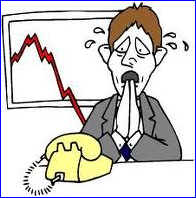 I think that really helps to be successful in cold calling. I had only 2 out of 45 who didn’t respond. Of course I did get a lot of voice mails and no answers along the way! I also think people in hospitals are more friendly than other business settings. Look what they do for a living! Interesting article. I’m a commercial writer, so I wonder if I could use this type of cold calling to first find out the name and number of the person in charge of marketing…without saying that I’m going to then cold call them to find out their freelance writing needs (which often doesn’t get me past the gatekeeper). Theda: I don’t see why you couldn’t use cold calling to get to the people in charge of marketing at companies. You might also “warm” up these calls by looking for people by name in companies through LinkedIn, Jigsaw or Twitter, since they might well tell you the name since it’s no skin off their back. Good luck and Happy New Year!